Mikael Yang is someone who I was introduced to by Nathan Barry and we met at Andrew Warner’s whiskey party at Social Media Marketing World. He is the founder of ManyChat, the leading Facebook messenger chat software on the market and it’s actually the chat software that I’m currently using for my store and blog. Today, we’re going to pick Mikael’s brain about some of the current and future applications of Facebook chat as well as why he decided to start his business. You’re listening to the My Wife Quit Her Job Podcast, the place where I bring on successful bootstrapped business owners and dig deep into what strategies they use to grow their businesses. 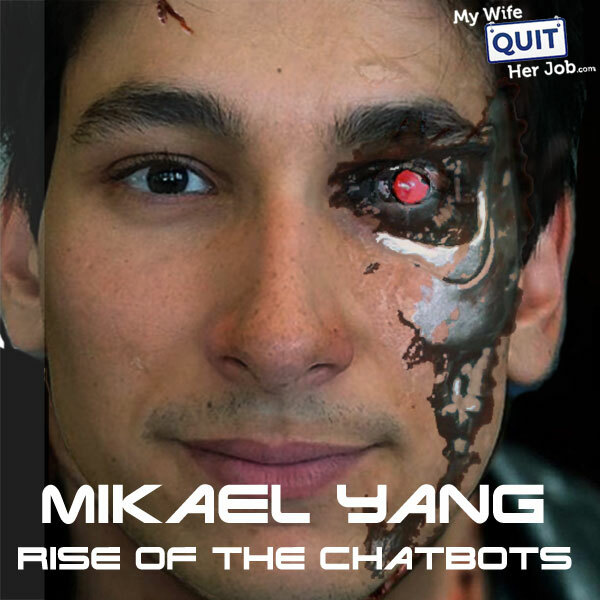 Today on this podcast episode, I have Mikael Yang, the founder of ManyChat on the show. And as many of you know, Facebook Messenger marketing is something that I’ve been using for both my blog and my online store with great success. Anyway, today we’re going to be talking about the future of Facebook Messenger marketing. But before we begin, I want to give a quick shout out to Privy who is a sponsor of the show. Privy is the tool that I use to build my email list for both my blog and my online store. Now, there are a bunch of companies out there that will manage your email capture forms, but I like Privy because they specialize in e-commerce. And right now I’m using Privy to display a cool wheel of fortune pop-up. Basically a user gives their email for a chance to win valuable prizes in our store. And customers love the gamification aspect of this, and when I implemented this form email sign ups increased by 131%. I also want to give a quick shout out to Klaviyo who is also a sponsor of the show. Always blessed to have Klaviyo as a sponsor because they are the email marketing platform that I personally use for my e-commerce store, and I depend on them for over 30% of my revenues. Now Klaviyo is the only email platform out there that is specifically built for ecommerce stores and here is why it’s so powerful. Klaviyo can track every single customer who has shopped in your store and exactly what they bought. So let’s say I want to send an email to everyone who purchased a red handkerchief in the last week, easy. Let’s say I want to set up a special auto-responder sequence to my customers depending on what they purchased, piece of cake, and there is full revenue tracking on every single email. Klaviyo is the most powerful email platform that I’ve ever used and you could try them for free at mywifequitherjob.com/K-L-A-V-I-Y-O. Once again that’s mywifequitherjob.com/K-L-A-V-I-Y-O, now on to the show. Steve: Welcome to the My Wife Quit Her Job Podcast. Today I’m thrilled to have Mikael Yang on the show. Now Mikael is someone who I was introduced to by Nathan Berry. But we actually didn’t get a chance to meet until we saw each other at Andrew Warner’s whiskey party at Social Media Marketing World. Anyways, Mikael is the founder of ManyChat, the leading Facebook Messenger chat software on the market. And it’s actually the chat software that I’m currently using for my store and my blog. And I’ve been getting a killer ROI from that has blown my email marketing numbers out of the water. And today what we’re going to do, is we’re going to pick Mikael’s brain about some of the current and future applications of Facebook chat as well as why he decided to start his business. And with that, welcome to show Mikael. How are you doing today, man? Mikael: I’m doing great. Thanks for having me Steve. Steve: Yeah, Mikael, so when you are at Social Media Marketing World, you were like the celebrity with like a mob of people following you around. But for the benefit of my listeners, what is ManyChat, and why did you actually start this company? Mikael: So ManyChat is a Messenger marketing platform. It helps businesses do marketing, sales and support through Facebook Messenger. And basically, the reason to do that is Facebook Messenger has over 1.3 billion people using it monthly, and it’s the most engaging channel right now on the market. And that’s actually the answer to the second question. That’s why we started the company because we saw an opportunity to deliver a lot of value to businesses by helping them leverage this new channel of communication with their customers. We started in 2015 with a different Messenger, it was Telegram Messenger. I don’t know if your listeners know about this Messenger. But it’s kind of like Facebook Messenger, WhatsApp, Fiber, but just popular in different countries. And it’s one of the more like advanced in terms of technology Messengers, one of the most secure Messengers out there. And they were one of the first Western Messengers to open up their API. And basically what that means is that Messengers are typically owned by their companies that developed them. And they are closed gardens, which means that developers cannot build on top of them. And Telegram opened up their API so that developers like ourselves could build platforms on top of them. And we’ve built one of the biggest bot platforms and Messenger marketing platforms on top of it. And a year later, Facebook Messenger opened up, and Facebook Messenger in terms of its reach is just much bigger. It has many more people using it. It has many more businesses using it. So for us, it was a no brainer to develop, to take what we’ve learned from Telegram and to take it to Facebook Messenger. And that’s how we’ve launched ManyChat just a month after Facebook has opened up their API. Steve: Were you using chat to market your own stuff before you got into this, or did you just decide to go with it because you knew that chat was going to be the next big thing? Mikael: Yeah, that’s great question. So we’ve been doing projects since I was 19, so for over eight years. And one of the projects that we did was a Messenger that was the whole theme of it was entertainment, you could message to friends [inaudible 00:06:22]. And we saw that compared to applications that didn’t use the messaging technology, ours had five, six times more retention, because there was this loop of sending a message, getting your friends into the app again, receiving a reply, getting into the app again, etc. So we experienced firsthand the power of how messaging is super engaging. So when Telegram opened up, we saw 65 million people that were using Telegram at that time, every month that were, the only thing that they were doing was just messaging each other and there was no business application to use Telegram. So we like my first thought was, why not use this channel to broadcast messages the same way that you would do an email campaign, but through Messenger and get a list, a Messenger list inside and start doing broadcasts. And that’s exactly — I tried to do it myself using the APIs. I have a technical background, and after a few hours of struggling with Postgres databases, setting up an instance on Hiroko [ph], etc, I just thought like, this is way too much work to do just a simple broadcast. So I called up my technical co founder Anthony, who is just a wizard of technology. And I said, like, we got to do this platform. And in just about a few days, we had a working MVP, where you could connect your bots to the app and get subscribers into broadcast. Steve: Cool. So Mikael, this topic of Messenger marketing is still relatively new. And I know that there’s a lot of skeptics out there, because we use Messenger to communicate with our friends and our family. And so the question is, and the question that I’ve been getting is why should people use Messenger bots for marketing? Isn’t that going to piss people off? Isn’t it kind of intrusive and spammy? Mikael: Hmm, that’s a great question. So Messenger is much more engaging than email. And that is because it is delivered to the inbox that you check like multiple times every day. And some businesses have this hesitation, like is it okay to be in that space where you talk only to your friends? And the answer is yes, because it’s the same way that every marketing channel starts. Usually, it’s a platform that is used only to communicate with a community or friends or family, there’s this use case where people use it for the most like basic social needs. And then that platform gets opened up for businesses. And the difference between Messenger and other platforms is that the customer stays always in control and I’m going to touch on that later. Because the next question is, like okay, businesses can use this, but how do we make so that the platform does not become spammy? Steve: Like email, for example, right? Like, I get tons of spam every day. Mikael: That’s true. Like, basically, I stopped using email. The only reason my system still checks email is because some of our service providers, there is no way to connect with them on Messenger. So this is the only like use case for email that is left like our whole company. We have over 30 people and we don’t use email internally, like zero emails to share it inside the company. We only use slack Messenger, Asana and like all the tools around email. And that was a big chord when that happened. We were like, well, this is where the world is heading. So, answering your question, it does feel like for some people, it could feel like, am I intruding, but like our data shows that customers are more than willing to subscribe to brands and businesses on Messenger and receive notifications from them and interact with them? The open rates, the typical open rates for broadcast on Messenger is 80, 90% and the CTRs are anywhere from 10, 20% to like, 30, 40, 50%. I had one girl come up to me and say, Messenger CTRs are going down, like they’re no longer where they used to be. And I’m like, well, really like what’s happening? Tell me more about it, because I want to learn what’s people’s experiences with the platform. And she is like, I used to get 76% and now I only get 48. I’m like, that’s not a reason for complaining. Mikael: What is your email CTR? Steve: Yeah, my email is anywhere between two and five I would say at most, yeah. Mikael: So it’s 10X of your email CTR? Mikael: Got it. Yeah, that’s what a lot of people are reporting, 10X of email. Steve: So let me ask you this, though. Do you think that it’s going to become saturated? Because it’s such a more personal medium, do you think it’ll get saturated quicker than email? Like, what do you see going forward? Mikael: So definitely, marketing channels are getting saturated and it’s just the nature. More people know about them, more people start using them, there’s only a limited amount of attention that people spend on the platforms. So definitely Messenger will become saturated. It’s nowhere near that point right now, I think there’s another 1, 2, 3 years where the brands will just start on boarding. Right now, it’s only the — there is a book called Crossing the Chasm. And so right now it’s only the innovators and the early adopters, it’s still like going only into the early majority stage. And I do think that it’s going to become more saturated. But look at email, like it took email to get to this point 20 years. And if you look at the numbers, email marketing as an industry is growing, like it’s not declining at this point. I think it will in the next few years but right now, it’s still growing. And the difference between email and Messenger is that email is an open protocol. It’s an open platform, nobody controls email. And Messenger is controlled by let’s say, Facebook, WhatsApp is also control by Facebook; other Messengers are controlled by other companies. Their number one goal is to make sure that the messaging experience is valuable to the end user. If that suffers, then like nothing will — like they don’t have another aim other than making sure that their Messenger is used by maximum amount of people, maximum amount of time, and with maximum frequency. So if they see that this is starting to degrade user experience, they’re going to put systems in place that will make sure that the end user is happy and receives valuable information from businesses, because there is a fine line between like being spammy and being helpful for the customer. Steve: I guess the key difference here is that anyone can send me email, but no one can just message me out of the blue, right? I guess that’s the one key difference. Mikael: Exactly. If somebody has your email, and they’ve got it through you opting in or from them buying a database or like stealing a list, they can message you. That’s basically your email is a key to your inbox. For Messenger, you have to opt in consciously, and no business can message you, can initiate a conversation unless you start a conversation with them. That’s one of the key differences. That’s true. Steve: So given that Facebook is in control here, and I know you’re probably biased, but if I’m a company, what would I prioritize, getting an email or a Messenger subscriber, because Facebook might change things going forward, right? They might start charging, they might limit the scope, whereas email is something that we’re in control of. So how would you prioritize the two? Mikael: So I think that that question comes up a lot when we are talking to businesses. And typically what we say to them is that you don’t have to choose between email and Messenger. It’s not something that like one thing, if you use one thing, you cannot use the other. I think you should start getting and like gathering your Messenger list and you should not dump your email strategy, get your emails, and get your Messenger list. And actually, if you get a Messenger list like we have a lot of people who are using their Messenger list to get people’s emails. Just a few weeks ago, Facebook Messenger introduced an update that allows people to share their email with the bot with just one tap. So you could ask something like, you could run ads to your Messenger bots, get the lead on Messenger, and then say something like, by the way, we have this eBook, if you want it, like do you want it? And if the person answers yes, you say okay, what’s the best email I can send it to? And they tap like share email and you get the email and ManyChat integrates seamlessly with MailChimp, Active Campaign, any email service provider that is connected through Zapier. So you can actually get the Messenger subscriber and turn that Messenger subscriber into an email subscriber. So now you have two points of contact with the same person, which makes your connection even stronger. Steve: Interesting. So what are some of the best ways that you’ve seen some of your clients get both chat subscribers as well as email subscribers. Mikael: So this was one of the ways that people do this. Basically, it’s all about when you ask the person to share a point of contact with you. And Messenger like starting conversation in Messenger is one way to do that, people sharing an email is not a way — people sharing a mobile phone number is the third way. There are different channels which you can unlock, basically, when you are connecting with your subscriber. And typically the architecture of this process is pretty much the same. You ask them for the point of contact in return for some value that you’re giving them. So it’s typically a strategy that some people call a lead magnet, like you have to have something of value and say like, hey, if you want this thing, this eBook, this video, this something, a consultation, an appraisal or something, leave us your Messenger, we’ll contact you and or will deliver it to you, etc. So the same way that you would get an email subscriber, you would use the same strategies to get a Messenger subscriber and vice versa. So specifically what I was referring to as you know in ManyChat, you offer all these different growth tools like different ways to get email addresses. And I was just curious which one is the best performing one that most marketers are using today. Mikael: We do have a lot of growth tools. But basically for your listeners who might not be familiar with ManyChat interface, growth tools are a set of tools that lets you convert any traffic into Messenger subscribers. And that can be a website traffic, that could be a Facebook ad, that can be your social media followers, and we provide like certain tools to convert those people into Messenger subscribers. I think one of the best things right now that is working really good for businesses is actually if you have a Facebook page and doing the comments to Messenger growth tool. Basically, it allows you to convert anyone who comments on a Facebook post to a Messenger subscriber by sending them an auto message as a response to that comment. And we’ve seen a lot of people getting amazing results, getting hundreds or even thousands of subscribers using that one growth tool. And specifically, it is really powerful paired with a Facebook Live. If you have a following, if you have people watching your Facebook Lives, or if you can make your Facebook Live appear in front of a lot of people, then connecting a comment growth tool to Facebook Live will basically try to turn everyone who comments on the Facebook Live and people who are commenting on the Facebook Live like a lot. It’s one of the best ways to get comments. And it will start an interaction with them on Messenger and if they’re interested, they will respond. And that’s how you get subscribers. Steve: So let me ask you this. I know Facebook has been cracking down on using language that attracts comments, right? So if you’re not doing a Facebook Live, for example, you can’t just go on and say, hey, comment yes, to get this lead magnet, because Facebook will probably reduce the reach of that post, right? And so how are people doing it without Lives? Mikael: So the thing that you’re referring to is the engagement baits that Facebook started to crack down on, and I’ve asked this question to our partnership manager and I’m still waiting for a response from them is that does that actually count towards sending lead magnets and like providing any kind of value through Messenger. Because basically engagement baiting, what Facebook was trying to crack on is they were trying to reduce the number of posts that gets fake engagement, that get engagement that is not supposed to be there like voting on the picture or something else. And the commenting, the reason for commenting is not because you want to increase the reach of the post which is a great side effect. But for a lot of people that’s not the actual reason to do that. Commenting is just a really natural way to opt in into the bot because when you comment, the bot sends your reply, you reply back like there’s a lot of conversion steps that are dismissed when you do the comments to Messenger growth tool. And so we are waiting for a reply from them. Right now it’s a gray area. And the way to answering your question I would use a Facebook video. I’ve seen a lot of people using a video to actually ask a question and get replies, and respond to those replies accordingly. Also asking an open ended question like nobody, like it’s concert engagement bait to like just say comment to something. But if you just ask a question there, like a yes or no question or something without specifically telling people like to do something in return for something, if this is considered by Facebook to be a natural part of the social interaction, then everything is good. So these are two ways I would suggest, using a video or asking an open ended question. Steve: So does that imply then that you should have like ManyChat try to get a subscriber off of any comment, not necessarily using a specific keyword? Mikael: If it’s an open ended question that’s not an open question, if it’s a yes or no question, then you can actually do automations based on yes and nos. And you can actually do the automation based on without a keyword because if the person has engaged with that post, it opens up the possibility of the page replying to them. Because basically when you think about this, when a person comments on a page’s post, they started an interaction with this business, they are interested, and they have something to say in reply to what the business has said. So there is a conversation that is going on right now in the comments with the person and the business. So there are ways to like if you don’t use keywords functionality. So basically, again, for people who are not familiar with ManyChat, basically, you can reply either to comments that have certain keywords mentioning in the comments or you can reply to all of the comments. And what Steve is referring to is maybe replying to all the comments. I think that’s a viable strategy. It’s not as targeted as replying to certain keywords. But I do think it’s like you should always think about the customer. And there is like the golden rule of marketing, market to others as you would want to be marketed to yourself. So imagine yourself in the shoes of your customer and think like, when I wrote this comment, would I expect a message from the business? How would I feel if I got it? Would it feel intrusive or would it feel natural? And if the answer is natural and relevant, then by all means, do it. Steve: So Mikael, because a large part of my audience, they sell physical products online, what are some of the applications that you’ve seen for e-commerce stores selling physical products with chat bots? Mikael: Yeah, e-commerce like we’ve seen people just making — this is going to — I don’t want this sound like that everyone can get the same results but e-commerce has been big on Messenger marketing. And so I’ve seen results where just a person was selling t-shirts and just made a few. I think he made over $5,000 in sales in just 24 hours of starting it. And so it was really — I think it was a great result for a person who is a single person operation and just starting out. Steve: How did he acquire subscribers? Mikael: I think he run ads like he shared with me the end results. And there is like so many stories that right now it’s like even hard to go into the details of every story. But if I remember correctly, he run ads to his bots and there’s this thing called the Jason ads. Basically Facebook a year ago, Facebook introduced ads that show up in the news feeds. And when you click on them, it starts a conversation with the business. So this basically, they are called click to Messenger ads. So basically, you can create an ad on Facebook that promotes your bots. And instead of going to a landing page, the person goes to the Messenger, straight to Messenger, and the bot starts the interaction. The reason to do that is if you think about a landing page, the only like purpose of a landing page is either to get you to an instant sale or to get you a lead so that the person leaves their contact information. Facebook Messenger when you run that ad gets you and instantly because when the person starts a conversation on Messenger, you get their first name, last name, their profile picture, gender, time zone, like a lot of information. But most importantly, you get the connection, the ability to reengage with them on Facebook Messenger. Steve: Yeah so just to reinforce your point, that’s how I’ve been building my list. So I’m running an ad right now. I’m doing a free plus shipping giveaway where I’m giving away a free handkerchief on our store. When they click on the ad, it opens up a Messenger bot, and then I give them basically a coupon to get this free handkerchief in the Messenger. And then on the landing page, I actually try to get an email. So, if all goes well, I get an email subscriber, I get a chat subscriber, and I get a sale as well. And that’s worked really well so far. Mikael: Are you already getting the email subscriber on the landing page? Steve: I’m getting on the landing page because the landing page I give a lot more information about exactly what the product is. I provide pictures about exactly what they’re getting. I would have tried to get it in the chat window, but they don’t have enough information to want to give me the email I felt. Mikael: Got it. If you think about like, I would just experiment because there is this, if you try to just use user input with an email type, they will be able to share the email with one tap. And it’s just such a natural thing to do because if you think about your Messenger experience, how many times have you talked to somebody and somebody said to you like, okay, I’ll send you a calendar invite, what’s your email? Or I’ll send this over to you, what’s your email? Your use — before even businesses have entered the messaging space, you were already sending your email to your friends through Messenger for one reason or the other. So I would just try it out and see like, what happens. If you provide enough context to them, and enough conversational value what you’re going to give them for this, I think that they are going to share the email with you even before they’re going to visit the landing page. Steve: Interesting. Yeah, definitely should give that a try. One thing I’ve noticed about Facebook, like the lead ads and whatnot, is that the default email subscriber isn’t necessarily their main email. So for example, like for Facebook, I’m using a way old email address because I signed up for Facebook way back in 2008, or whenever I signed up. So have you found that as well? Mikael: Just the text field. So we will see how that plays out. I think for a lot of people, that increase conversions, like even though some people have older emails connected to their Facebook accounts, it’s just the simplicity of tapping the pre filled email like increases the conversion much more than the number of people who have their older emails attached to the platform. And those who do want to share the correct email with you, they can just type in their current email address, which was the only case before they rolled out the sharing of the email with one tap? Steve: Okay, yeah, it’s definitely worth experimenting with. On my landing page like, there’s a bunch of sense of urgency, like I have a countdown timer, I have a detailed description. So yeah, it’s probably worth experimenting to see which one works better. Mikael, I also want to touch upon spam. Like, what are some of the rules regarding sending these broadcasts, because I know you can’t just fire off coupons and just start spamming people with offers, right, what are the rules of that? Mikael: Exactly as we’ve mentioned before in this interview, Facebook, the number one thing for Facebook is the end users experience. So they’re really strict about what you can and cannot send on Messenger. I’ve already mentioned that you have a 24 hour window after the last user interaction. So not just the first one, but every time they use your opens, your bots and presses a button inside of it, the 24 hour window starts where you can send anything, promotional messages, coupons, etc. But after 24 hours after the last user interaction, you cannot send anything promotional; you can only send things that are non promotional. And please do go to Facebook policies. They’re short, they’re succinct, anyone will understand that they’re written in plain language and just see what’s okay, what’s not, okay. Basically, after 24 hours, you cannot just directly sell anything to your customers. The only things that you can send is content, news, product updates, like things that are not like nothing or pay, here’s a 20% sale or something. That thing will get you like banned. So please be mindful of that and check the Facebook Messenger policies before doing anything. Steve: So what are some clever ways that you’ve seen people do broadcast to get them to have an interaction, so you can send them a promotion? Mikael: So I would say anything engaging like anything that would get your customers to engage would be a good idea, because engaging content means that you have captured their interests enough so that the person actually lifted their finger and tapped on a button without just swiping back to their friends’ messages. So I think one of the best ways that we’ve seen people do this is by asking questions, and by asking questions stuff like pay, we’ve got a new podcast, do you want to listen to it now, or maybe later. And people that maybe wouldn’t click on now, a lot of them start to click on maybe later, which sets up a let’s say a 30 or an hour timer, and then reminds them, hey, you wanted to listen to this podcast an hour later. Or same thing with a blog posts or maybe doing surveys about what people think about this or that issue? Of course, it should be relevant to your audience. You’re talking to your audience. So it should be relevant to the things that your brand and your business is involved in. And so yeah, asking questions is one of the best things in Messenger. Steve: Is it okay to say something like, hey, we’re having a special promotion, would you like to hear about it? Yes, no, unsubscribe. Mikael: No, I think that would be crossing the line. Everything should be checked. There is a Messenger community that is the official Facebook Messenger community, and I would encourage ask any questions there. But basically, asking people if they would be interested in the promotion is already, I would say, in my opinion, I would say it’s promotional. The correct answer here is even Facebook says that right now different teams have different opinions and said it depends on like which reviewer that message will fall. So I would stay away from anything that could get you in trouble until the rules settle down. So until Facebook itself decides what is okay and what is not okay, and like gets past this ambiguity, I would stay in the safe and try to not send anything that would be considered promotional. Steve: I just wanted to take a moment to tell you about a brand new service that I personally just launched that will help you grow your email list for free. First off, my new business is called GoBrandWin.com. And it’s a service that helps e-commerce sellers build their email list through group giveaways. And here’s how it works. If you own your own e-commerce brand, and you have a following what you do is you contribute a gift card toward your products valued at $200 or more. Now Go Brand Win will assemble gift cards from other participating brands with a similar customer demographic into one massive sweepstakes giveaway. What about I’ve got like new products that just arrived in the store? Would you like to see them? Mikael: That might be considered as a product update. So there is a way to — there is certain tags inside the Facebook Messenger. And one of them is product update. Usually it is more towards the bot itself. So like the bot getting new functionality, but like it depends on how you think about this, like maybe new products inside the bot is like now you can buy, now you can do something inside the bot that you weren’t able to do before that. But I don’t want to – I’m not a Facebook reviewer. Steve: Yeah, it sounds like it’s the Wild West right now. Right? Mikael: Exactly. The point here is not to like, hey, can we do this, can we do that. I’ve seen people who are doing promotional messages, like for half a year and they then get blocked or banned, or restricted in any way. And I’ve seen people who were doing something like that could be considered by that was like kind of in the gray area, and they got the restricted. So basically, it all depends. Even Facebook’s own internal policies change. So they see how people are using the platform. They see how end users respond to that usage. And based on that they make the rules and they have guidelines internally and they change those guidelines and they are not sharing those guidelines publicly. Mikael: So the answer here is that nobody actually knows what is like the current state and what is okay, and what is not okay because even Facebook changes this stuff. And so the answer is, it is wild, wild west, be careful, read Messenger policies, and just have a head of your own and don’t get in trouble by sending like — because I’ve seen people who are sending like they knew about the 24 hour message window. And they were sending like just directly sales pitches like hey, 20% off only in the next hour or something. And like, they got restricted, and like we couldn’t do anything about this. And they reached out to us and said, like, hey, we’ve got this thing. And we were like, yeah, you were violating Facebook Messenger policies. You cannot do that. That’s what you get for that. So yeah, I would, I would say like I would stick to questions, I would stick to quizzes, I would stick to surveys. And Facebook is going to introduce a way like, there’s a definitely going to be a way for businesses to send promotional messages to their customers to reengage them using the platform. Basically, that’s how Facebook makes money. So you should expect that. And before Facebook releases a solution like that, just grow your list. Don’t be like, don’t try to optimize everything. This channel is not something that is like this new shiny thing that is going to go away like in a few months. And if you don’t get value right now, you’re never going to get it. Go try it, and start growing your list and start learning how it works, because this is going to be the channel that is going to dominate all the other channels in the next 3, 5, 7 years. This is a long term game, you’re starting to build your Messenger list, this is going to be the main channel of communication of your customers in the next three to seven years. So it’s not a question of trying to extract as much value right now. So just be careful, grow your list, learn how it works, provide as much value as possible, and then see what happens next because like, a lot of these rules are going to set up exactly this year. Steve: I see. So basically, what you’re saying is Facebook’s kind of vague on the guidelines right now. So just err on the side of caution so you don’t get banned. Steve: So no content basically yeah. Mikael: Yeah, send no content and when the person engages, then you have the 24 hour window. And Facebook is doing this for a reason. They don’t know themselves, like they are a technology company. And they have to strike this balance between giving businesses tools to markets and to grow and also giving customers the user experience that they will value and that will be good for them. And it’s a very delicate balance. And they themselves don’t know where that balance is. So the reason that they’re big about this is because now they can see how different interactions resolved in like different user experiences. And they can say, okay, this is what we’re going after. And then they’re going to put a stick in the ground and say, this is what is allowed and this is what is not allowed. Steve: Okay. I would also say that you should always give the user the option to unsubscribe with every broadcast, right? Is that just general good practice? Steve: That is a very good practice because that decreases the number of blocks that’s your page receives. And if your page receives a lot of blocks, then you’re going to get flagged for review and then you’re going to get, then you might get in trouble if you were sending something out. That was like in the gray area of the Messenger policies. So I would encourage everyone to make it super easy for your customers to unsubscribe. Right now it’s already easy, like, they can just swipe inside Messenger and delete the conversation with your bot, but not a lot of like, some people just don’t do it. They just read the messages and like, basically tolerate that you’re in their inbox. So please do send an unsubscribe option the same way that you would you do that inside email, there should be a link to unsubscribe from your broadcasts and from your bot but leaving the option to do live chat, etc. So ask your every message, every broadcast, I would say something, if you ever wanted to unsubscribe from these messages, just type stop and just like STOP all caps or something, or provide them a button to do that just like unsubscribe or manage subscriptions, yeah. Steve: Okay. Hey, Mikael, we’ve been chatting for quite a while. I want to be respectful of your time. Where can people learn more about your company and where can they get ahold of you if they have any questions? Mikael: So the company is M-A-N-Y-C-H-A-T, ManyChat.com. And you can go to ManyChat.com and connect your Facebook page with one click and start getting your first subscribers and doing your first broadcasts, and then maybe even graduate to doing more sophisticated marketing automation. We do have a free course that we put out just a week ago, and it’s over 10 hours of content. And it’s like people were charging for this like hundreds and thousands of dollars. And we are putting this content out for free just so that millions of businesses can learn how to do Messenger marketing and how to connect with their customers. So it is beneficial to the customer and to the business and is not violating any policies of Facebook Messenger. So if there is something that I would encourage everyone to do is just check it out. The platform is free to use like there’s a freemium, it’s a freemium model so there is a free plan that will allow you to do everything that you want, get subscribers, do broadcasts. And as soon as you experience the results, as soon as you experience the open rates and the CTRs, you will get hooked like this is just going to be super engaging and you will want more of those results. But that’s for you to experience. Steve: Yeah I just want to add that you can do a lot of this stuff for free on the free plan on ManyChat. And the pro plan is actually pretty inexpensive, like I’m not affiliate with ManyChat in anyway, but compared to email marketing right now I think ManyChat just to be able to gather subscribers and send to them is really inexpensive now, and it’s like a no brainer to try right now. Mikael: Oh thank you, thank you Steve. Steve: All right Mikael. Thanks a lot for coming on the show. I really appreciate your time. Mikael: Great talking to you man. Hope you enjoyed that episode. Mikael actually lives right by my house, so we had a chance to grab coffee and hang out. He’s a super nice guy and he really knows his stuff. For more information about this episode, go to mywifequitherjob.com/episode215.